As I get older and more mature, I am becoming much more sure of my style and tastes. 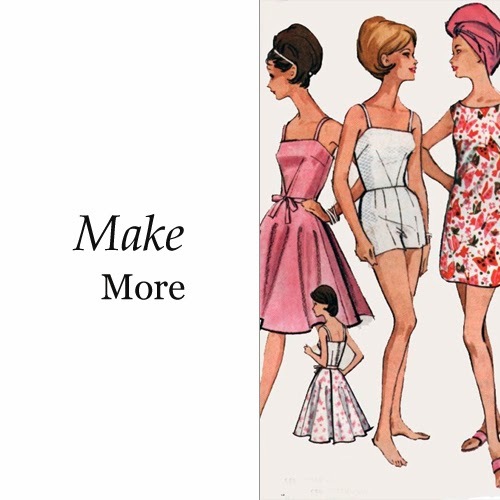 Lately that means I am longing for simple style that is not over complicated. I look much harder at the quality of an item and its lasting power in my wardrobe. 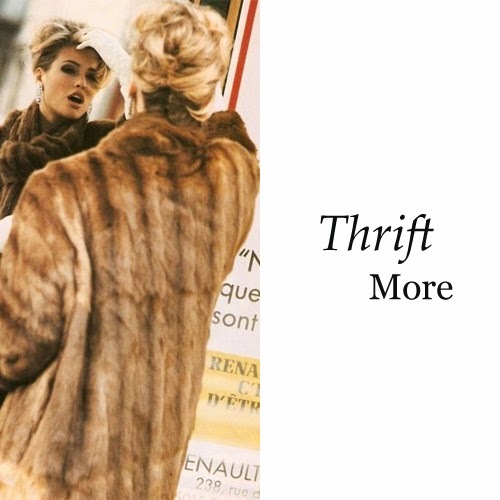 I long for a wardrobe with many tried and true reliable staples, but I also see room for some wow-factor pieces that bring excitement to even the simplest of outfits. If I had to define my style, it would probably by something to the effect of everyday style with a twist. When I am structuring my outfits I like to keep my jewelry simple so I can let those wardrobe staples or wow-factor items really stand out. These minimalist selections from Brilliant Earth could easily become everyday staples — and the diamonds are conflict free. I am completely smitten by the rose gold moon earrings. They would be the perfect little piece of intrigue for a brunch date or shopping trip. 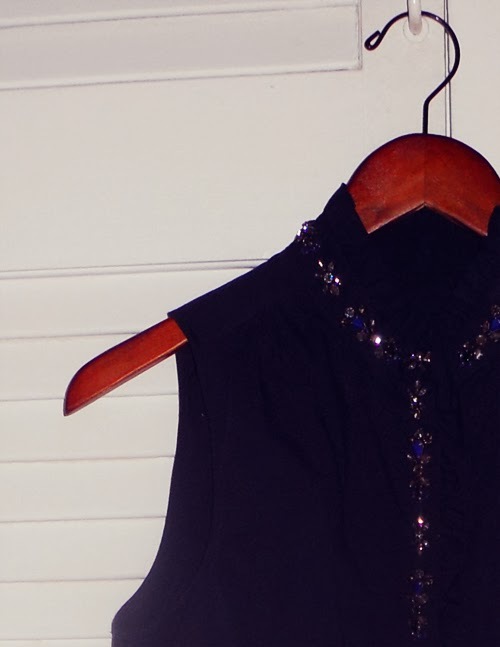 I had been eying this beautifully bedazzled blouse at J.Crew since fall. When it went on sale around Christmas time, I said “Thank you, Universe!” I love that it adds just enough sparkle to this work outfit without being overwhelming. It doesn’t require much accessorizing either. 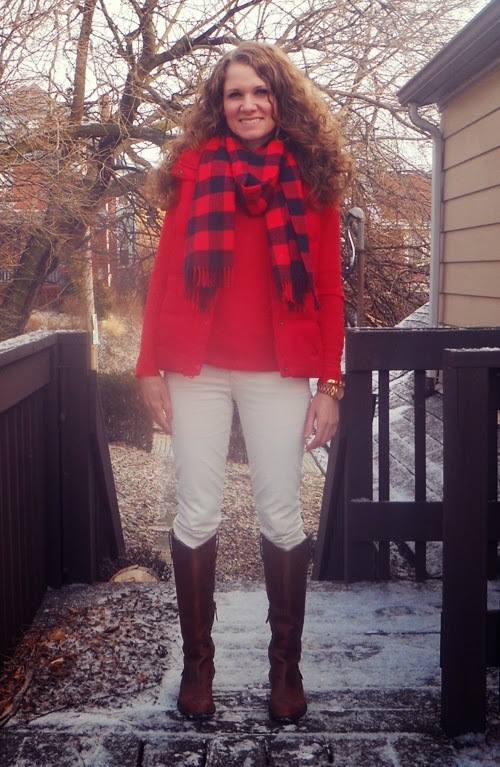 I wore it with simple, silver Stella & Dot studs. 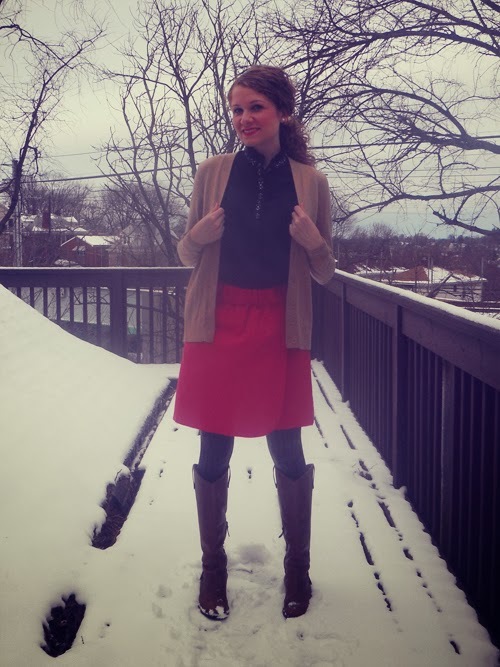 Since the blouse is a deep navy, I thought it would pop well against this red skirt. To temper the color blocking, I wore a neutral sweater. 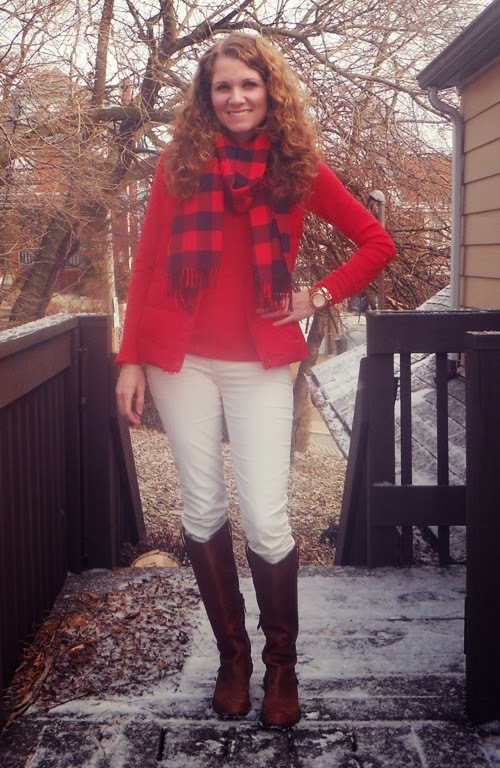 How do you style embellishments during the day? Are You a Frances or a Sophie? We watched Frances Ha the other night. 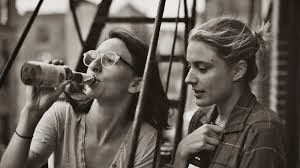 If you haven’t heard, Frances Ha is a movie about a girl trying to make it as a dancer in New York City. 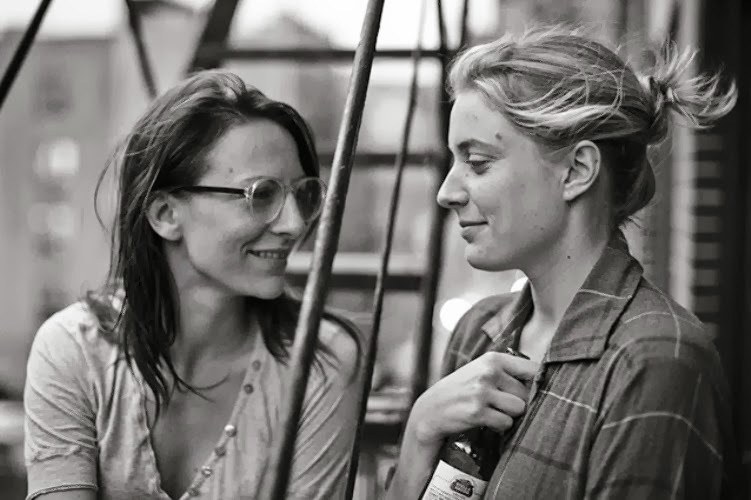 The two main characters Frances (Greta Gerwig) and Sophie (Mickey Sumner) are best friends that grow apart after Sophie announces she can no longer live with Frances because she found a better apartment. Frances who is struggling to find work as a dancer and just broke up with her boyfriend can’t afford to live with Sophie so she stays on a friend’s couch. I love the way their two separate but parallel lives are conveyed throughout the move in the way that they dress. Despite their differences they still compliment each other. I would say I probably lean more toward Sophie, but there is definitely room for free-spirited Frances in my life. Are you a Sophie or a Frances? Frances is a free spirit with no concrete career or relationship. At one point Frances is doing pirouettes to cross the street in a leather jacket, floral print dress and converse sneakers. 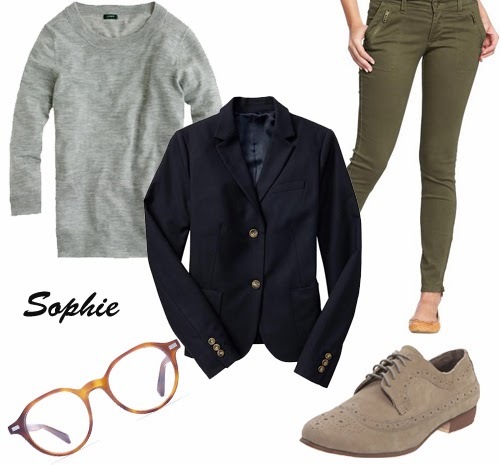 Sophie wears a smart blazer and oxfords and seems to have her life figured out with a great job and a serious relationship. These of course are the things we equate with having it all figured out, but the movie does a good job of questioning that. 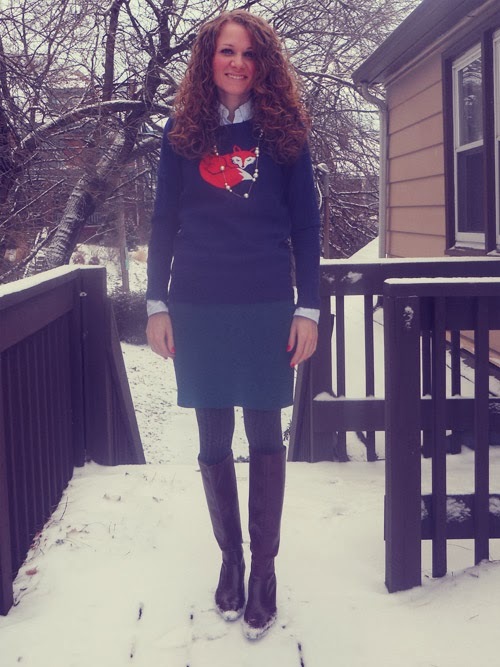 Several things come to mind when I look at this adorable fox sweater: Zooey Deschanel, Christmas gifts from your grandma, Firefox, Put a bird on it from Portlandia… the list goes on. My name is Christina, I’m 28 years old, and I am addicted to cute animals. Also, cat videos on YouTube, let’s just be honest. I don’t care how old I am. 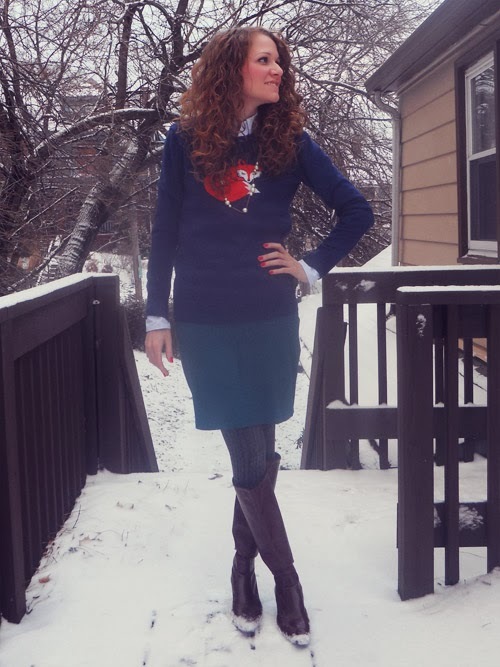 I am totally embracing the quirky placement of woodland creatures on clothing. After all, I am curious like a fox. 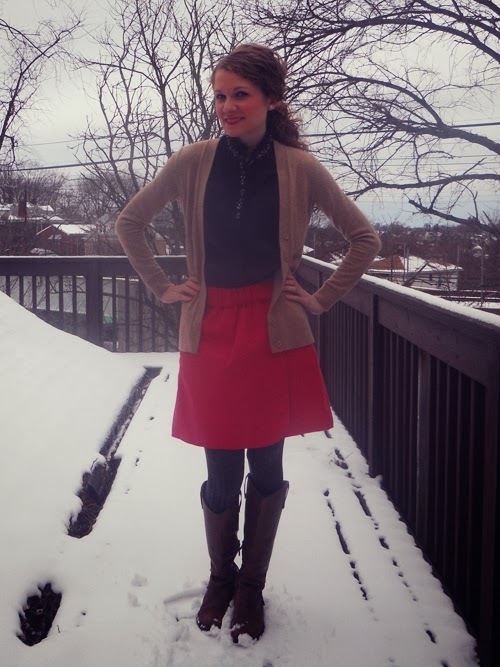 Last week I talked about wearing winter appropriate brights. 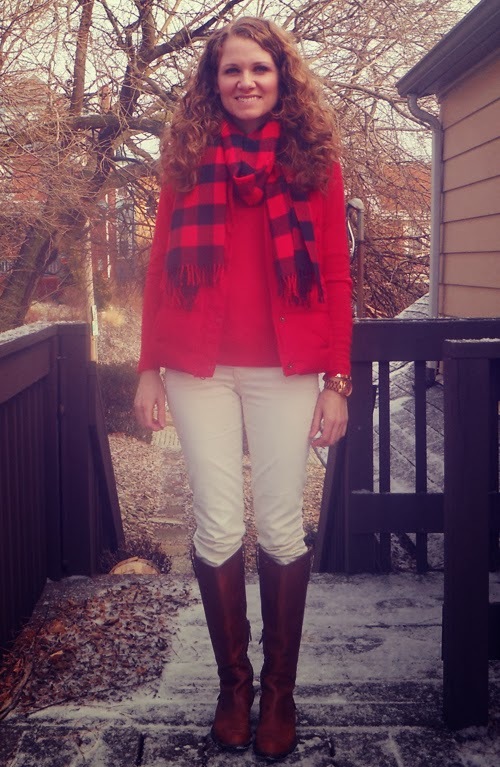 Red being an obvious choice with its distinct holiday color scheme and its roots in the classic buffalo check pattern that adorns winter scarves, coats, hats and the like. 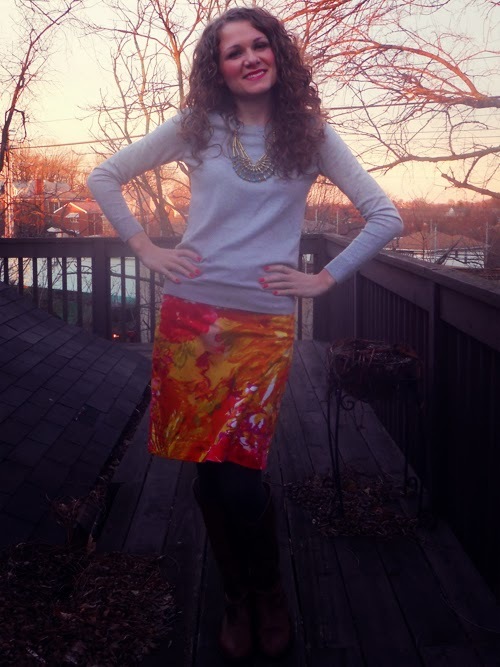 This week I am all about mixing spring brights with winter separates. There is something about the month of January that makes me extremely hopeful. It may be that spring is right around the corner. I am already starting to see bathing suits in stores so it can’t be that far away, right? With bright winter mornings like today’s, it’s hard not to look toward the horizon. 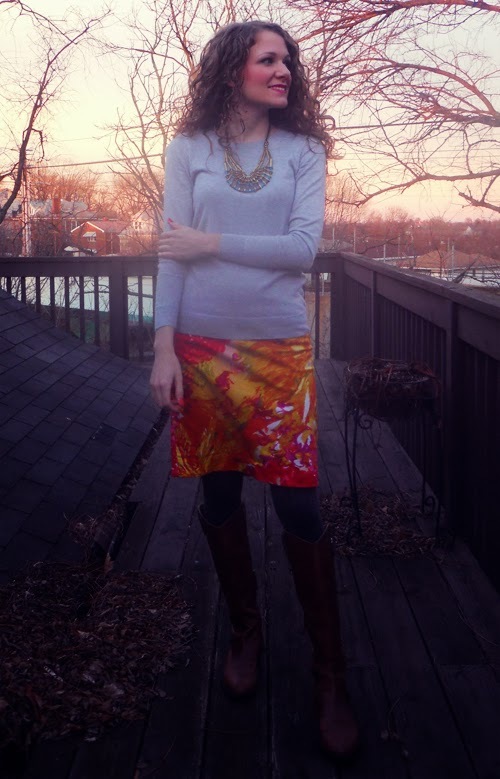 To incorporate this bold-print skirt with my winter separates, I tried to keep things fairly neutral with my gray sweater and tights. 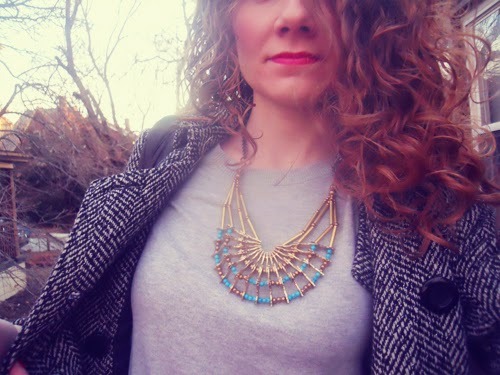 Not completely ignoring the warm colors in the skirt, I wore my brown riding boots, and I added an interesting texture and color with this gold and turquoise statement necklace. 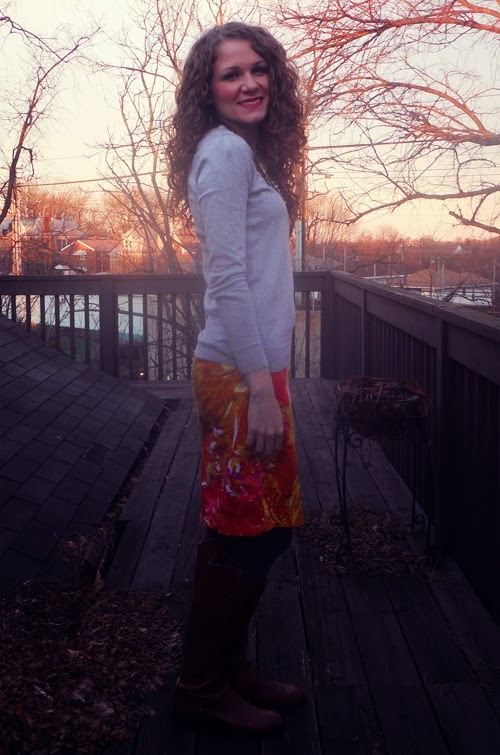 The thing I miss most about the warmer weather besides the … warmer weather are the unabashedly bright colors. 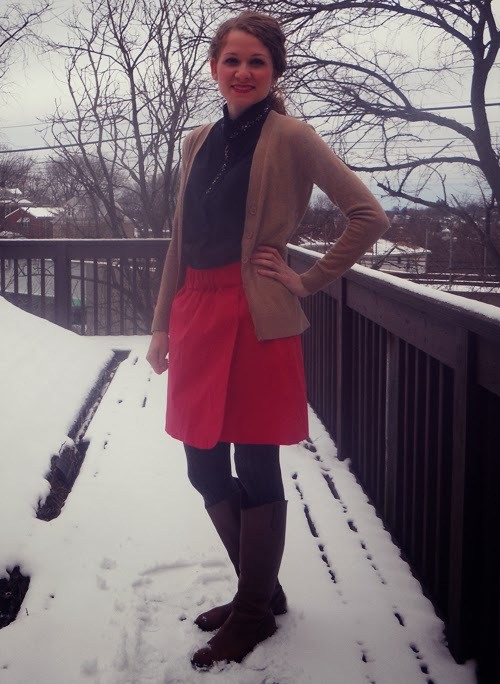 I like that with this outfit, I still get to be bright while looking appropriately wintery at the same time. 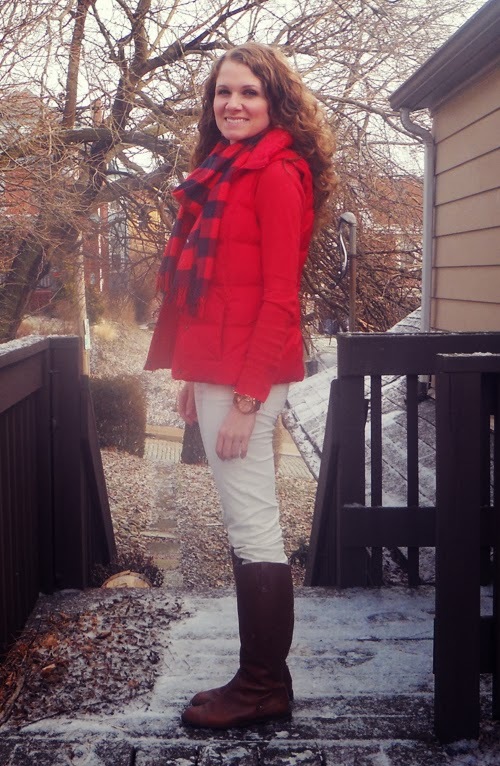 Also, I am currently obsessed with this buffalo plaid scarf. I searched high and low for it at my local Gap after I saw it in a Christmas ad. I finally found it in the men’s section. It goes with any winter outfit and was a perfect complement for our date night, which involved ice skating at PPG plaza downtown and the Winter Lights Show at the Phipps. Happy New Year! I know that’s almost a week late, but with the short week last week, this week felt like the official beginning of the new year. It was nice to let myself have the extra few days I needed before getting back into the swing of things helping to fulfill one of my New Year’s resolutions: to relax. 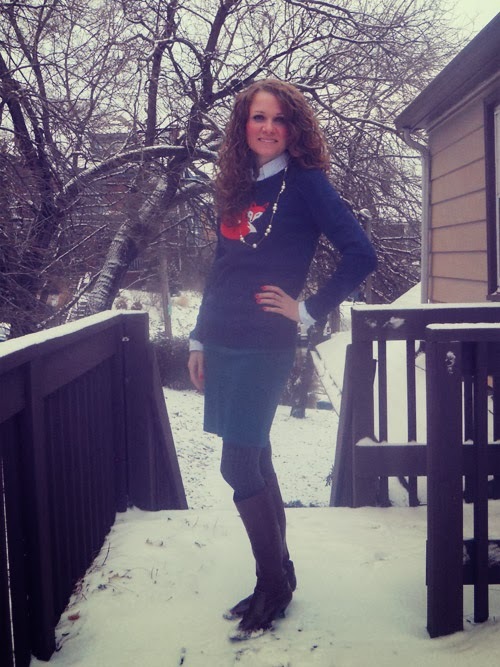 Last year, I started an MBA program, I coached figure skating, I freelanced, I blogged, and I was the social chair for my sorority’s alumnae organization in Pittsburgh. If I’ve learned anything in the past year, it was that I should do a better job of carving out time to relax or do something that I enjoy. That is easier said than done, but I want to continue to work on making that a part of my normal routine in the new year. 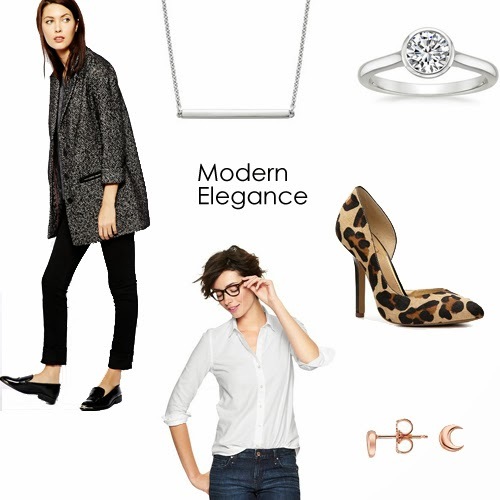 In addition to a handful of cliché goals, I dreamed up some style goals for the year. 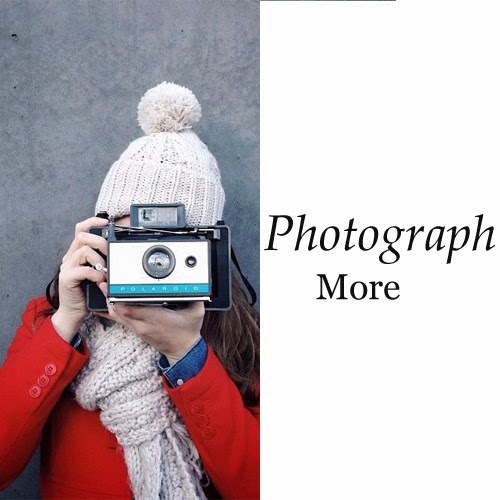 Writing this blog and the things I thrift, make and style because of it are some of the activities I enjoy the most. So I am hoping to do more of that in the New Year, while at the same time not pressuring myself to meet self-imposed deadlines. I want posts to come naturally and not feel forced because I haven’t posted in a few weeks, and I feel guilty about it. 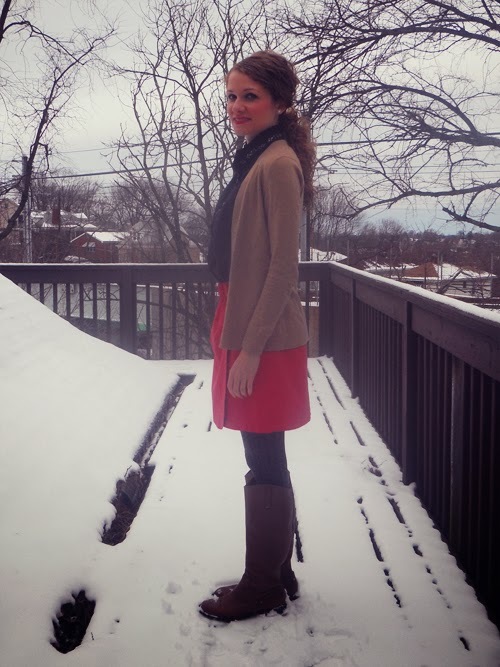 Here are my style resolutions for the year. Feel free to share your resolutions in the comments below. 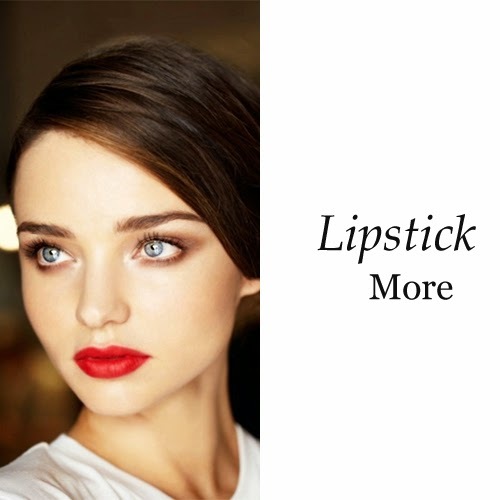 Try more new hair styles.